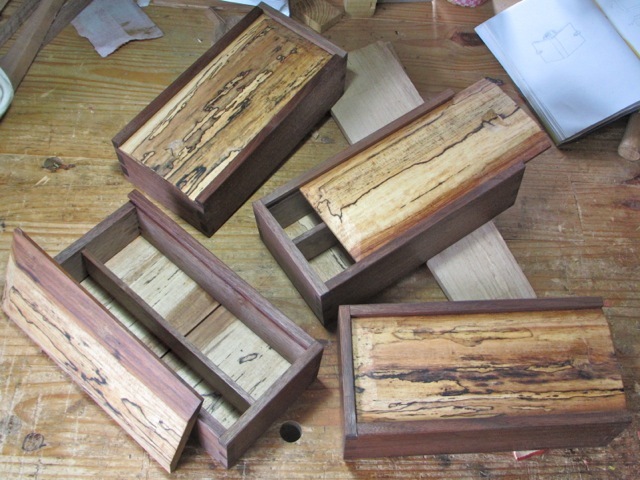 These are just a few of my more successful woodworking projects. They reflect different degrees of competence as my skills have developed, and looking back at some of the pieces, I would do things differently now. But even the simplest has its own integrity, which I’m still proud of. I built all of them primarily with hand tools, and many were built with no power tools at all. I will update the page periodically as I build new things. A trestle dining table made from cherry. A pair of Shaker nightstands in black cherry. 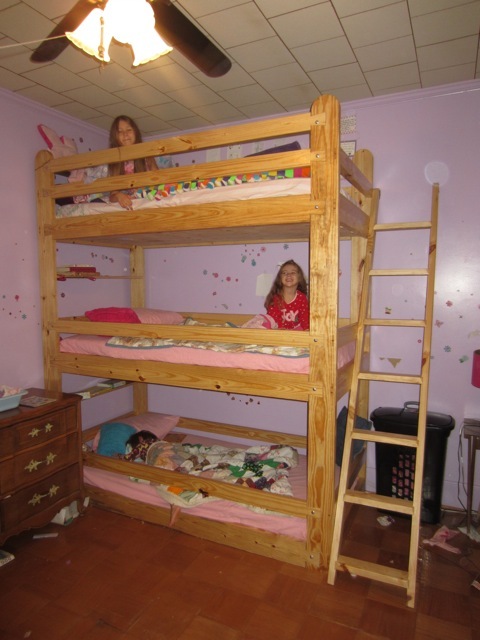 I built this three-tier bunk bed for my three daughters. I made it from southern yellow pine that I bought at the lumberyard. The joinery is mortise-and-tenon on the ends, with lapped dovetails (reinforced by carriage bolts) for the rails. Each bed has a built-in shelf at the head. And yes, the ladder is secured to the bed. I build a lot of bookshelves. This one features a solid poplar back and a live-edge pine top. Tool chest built from quarter-sawn cherry and spalted pecan. 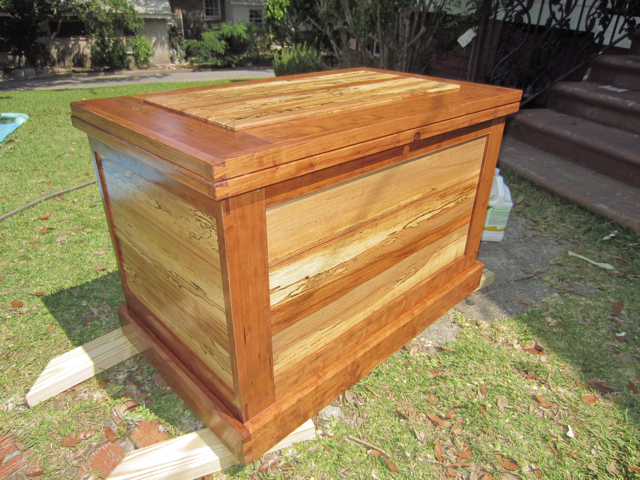 The chest is approximately 34″ wide, 22″ tall, and 20″ deep. It is finished with hand-rubbed Danish oil. My wife commissioned these pencil boxes for our children. The carcases are black walnut, and the tops and bottoms are spalted pecan. One of the first dovetailed carcases I built, this tool chest with inset tray has been very useful. I built these backsaws from kits I acquired from Blackburn Tools. The handles are spalted pecan. A small marking gauge I made from curly maple and purpleheart for my daughter. A stair saw I made from spalted pecan. A mortise gauge I made after a gauge I saw on Peter Follansbee’s blog. The woods are cherry and pecan, and the gauge works very well. 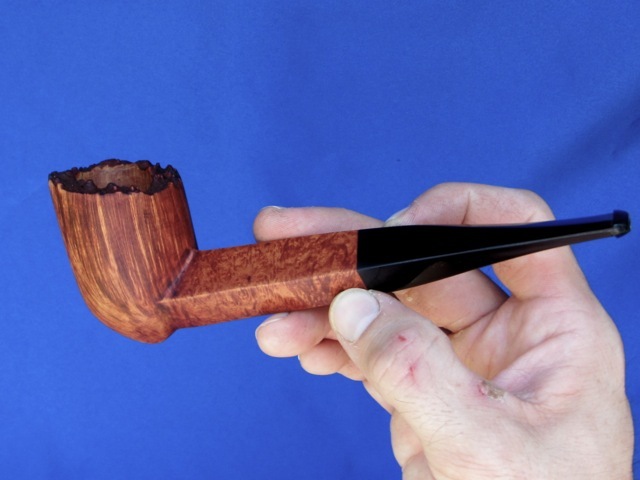 A briar pipe of my own design. 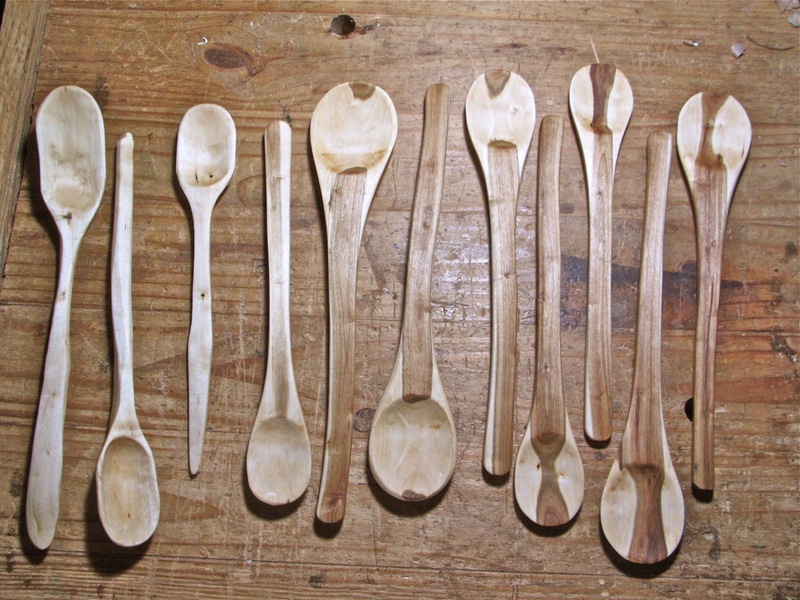 I make a lot of wooden spoons. I built this pine dovetailed box and wall shelf during a joinery class at Homestead Heritage in 2006. My wife made the bowls during a pottery class she took there. My first commissioned piece, a cedar altar cross for our church in Texas. The base design is sometimes called a “graded cross,” and the three steps may represent the three cardinal virtues (faith, hope, charity) or the three steps of penance (contrition, confession, satisfaction). My wife built this dovetailed casserole carrier under my direction. It is big enough to carry our biggest casserole dish. It is one of the most useful projects we have ever done, and we got to do it together. I’ve never seen such a thing, but it sounds interesting. This one is big enough to carry our biggest casserole, so it fits the smaller square ones, but with lots of space to spare. love the dovetailed tool chest. Did you cut the dovetails by hand? The Cost of Altar Cross made by wood.